I came across astaxanthin in May 2012 while continuing my research into antioxidants. What is astaxanthin? And why have I not heard of it before? So, I absolutely had to look into it in more detail, and read the studies and reviews completed up to date, as of June 2012, and, most importantly, research how astaxanthin affects glutathione activity. It appears that it is a relatively unknown dietary supplement with potent antioxidant capabilities, and it is rapidly becoming more “famous”. Astaxanthin is a carotenoid and a powerful antioxidant. Our bodies do not synthesize astaxanthin, so it can only be obtained from food or supplementation. Astaxanthin does not convert into vitamin A – good news, because it means that supplementation will not lead to vitamin A overdose and toxicity. Where can this antioxidant be found in nature? Astaxanthin is present in microalgae, fungi, plankton, yeast, and seafood - salmon, trout, krill, shrimp, crabs, lobsters - to all of which astaxanthin gives their distinct pink or red-orange hues. 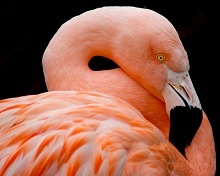 It also adds color to the feathers of birds – flamingos and quail. It is from astaxanthin in their food that these fish, sea creatures and birds pick up their special coloring. Natural supplemental astaxanthin is manufactured predominantly from microalgae Haematoccocus pruvialis. This algae produces a certain astaxanthin isomer that is the same as the form found in wild salmon and thus most commonly consumed by humans. This source of astaxanthin appears to be the most desirable when choosing a supplement. Our bodies know how to metabolize nutrients from salmon much better than from plankton or feathers. Other sources of natural supplemental astaxanthin may be krill, shrimp and yeast. Synthetic astaxanthin has also been developed. It is chemically derived and not advisable as a source of supplemental astaxanthin. There is a debate that the synthetic form may yield different results in clinical trials than the natural form, so scientists are not sure yet which form to prefer in their research. Studies done so far have used primarily the natural form of astaxanthin; however, at least one study I came across had used the synthetic form along with the natural form. Since the diet of farm raised salmon (and other seafood) is poor and results in white flesh, synthetic astaxanthin is fed to fish in order to improve the color and make the end product more appealing to consumers. For this reason you should always choose wild caught fish and seafood. Dosages of astaxanthin used in human trials varied from 1 mg to 100 mg taken either once, or daily over a period of several weeks up to a year, without any adverse reactions or side effects. Supplemental astaxanthin usually comes in 4 mg, 6 mg and 12 mg capsules to be taken once a day with a meal. And positive health results may be observed at doses as little as 4 mg after 2-6 weeks. Clinical studies have proven that supplemental astaxanthin is readily absorbed into the blood from the intestines and crosses blood-brain barrier. Astaxanthin plasma elimination half-life was assessed at 52 (+/- 40) hours (how fast it is eliminated from blood after a person stops taking a supplement). WHAT IS ASTAXANTHIN ANTIOXIDANT ACTION? In vitro and in vivo studies have shown that astaxanthin is a very potent scavenger of free radicals. It disrupts oxidant chain reactions and quenches dangerous reactive oxygen and nitrogen molecules. Because of a molecular structure that is different than that of other carotenoid antioxidants (beta- and alpha-carotene, lycopene, lutein and zeaxanthin), astaxanthin is a more powerful antioxidant. Its uniqueness lies in its ability to neutralize free radicals both outside and inside a cell preserving cell membrane. For this reason dietary supplementation with astaxanthin has a strong potential to provide much better antioxidant protection of a cell than other carotenoids. Review “Astaxanthin: a potential therapeutic agent in cardiovascular disease”, Fassett RG, Coombes JS., Marine Drugs 2011 Mar 21;9(3):447-65 states that astaxanthin is a potent antioxidant with anti-inflammatory properties and as such has potential as a therapeutic agent in atherosclerotic cardiovascular disease. Astaxanthin is a fat-soluble antioxidant. That is why astaxanthin supplement should be taken with a meal that contains fat or a quality fish oil supplement. In fact, research has shown that astaxanthin + fish oil combo exhibits even more powerful antioxidant and immuno-enhancing action. This could be due to the fact that they are found in fish together and work in synergy. To learn how astaxanthin affects glutathione activity visit our page Astaxanthin and Glutathione. WHAT IS ASTAXANTHIN BENEFIT TO HEALTH? Such exciting results in animal studies sparked interest in researching astaxanthin benefits in human subjects. Human studies have proven bioavailability of astaxanthin, its ability to be absorbed in bloodstream and to cross blood-brain barrier. No side effects were reported in any of the human trials. Search for “astaxanthin” at pubmed.org returned 909 articles as of 6/6/2012, and more studies are being added all the time. The research into the benefits of this antioxidant is ongoing. I will do my best to keep the information updated. The studies I reviewed while preparing this page can be accessed here. This amount of research proves that astaxanthin is an important and powerful antioxidant with anti-inflammatory and cell membrane protective qualities. Sufficient quantities of astaxanthin, comparable with the doses used in human trials, cannot be obtained from consumption of salmon and/or other seafood. Dietary supplementation with natural astaxanthin should be considered and discussed with your physician in order to benefit from this carotenoid antioxidant. Return to Top of What is astaxanthin?